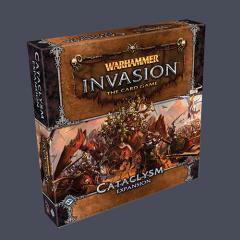 The battles of Warhammer: Invasion grow larger and more intense than ever before with the multiplayer battles of Cataclysm, the game's fourth deluxe expansion. Cataclysm comes with a rulebook, thirty-eight tokens, six fulcrum cards, and 159 player cards (three copies each of fifty-three different cards) that allow up to four players to war for dominion over the Old World. The expansion also provides new ammunition for those who wish to continue exploring the fast-paced, bloody, back-and-forth battles of the two-player matches from the Warhammer: Invasion The Card Game Core Set. The Cataclysm multiplayer format builds upon the game's classic kingdom building, questing, and battles, but follows rules for a new turn sequence that explores the shifting tides of battle between the Old World’s six main races. Meanwhile, you'll war to acquire as many copies as they can of a new form of token – the dominance token, which represents the success of your efforts to subdue your foes and establish your rule. This is not a standalone product. A copy of Warhammer: Invasion The Card Game is required to play. In order to sleeve your cards for this game, you would need 4 packs of FFGFFS05 - Standard CCG Size Sleeves.